Our local law enforcement has been and continues to be conspicuously in the news over the last year following high-profile incidents. After it looked like the spotlight might finally be fading in Ramsey County, it shifted over to Minneapolis. Make no mistake that the subject of police actions and accountability is a sobering one, and one that history has shown can have significant fallout. This spring marked the 25th Anniversary of the Rodney King riots, and that this summer marks the 50th Anniversary of the Detroit riots, and that both riots were sparked by what local residents considered unjust police action. If you experienced a police encounter that left you feeling that officers overstepped their proper authority, what are your options? To start, the Minnesota State Law Library has an excellent LibGuide of resources for researching police functions and duties. Also be aware that cities frequently post their police manuals online, including both Minneapolis and St. Paul (albeit with redactions). Locally, St. Paul has the Police Civilian Internal Affairs Review Commission (PCIARC). This group of nine civilians reviews complaints against Saint Paul Police Department Officers and makes disciplinary and policy recommendations to the Chief of Police. They can also help individuals file complaints and navigate the process. There is also this online resource from the Department of Justice regarding police misconduct with the option of filing a complaint. But be aware that filing one of these investigatory complaints at either the local or federal level is not a substitute for filing a lawsuit in civil court. You still may wish to contact a lawyer to discuss this legal options. Book-wise, we have a few gems here on our own shelves for more advanced reading and research (pictured above). 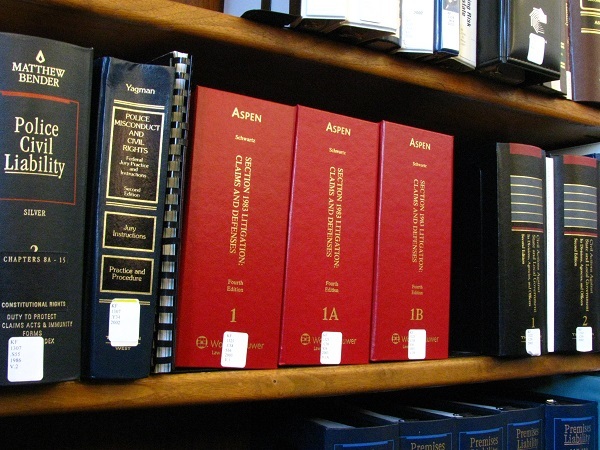 These include such titles as Police Misconduct: Law and Litigation (M. Avery, et al. ), Police Civil Liability ( I. Silver. ), Civil Actions Against State & Local Government: Its Divisions, Agencies & Officers (Thomson-Reuters 2d), and The Rights of Law Enforcement Officers (W. Aitchison). Don’t forget that our latest Westlaw subscription now gives easy access to many other related titles to assist you as you research this area of law.